Organized March 2006 " PRESERVING THE PAST FOR THE FUTURE"
at 7 PM at the Mountaineer Hose Co. Collect all seven of our Historical Commemorative Ornaments! See our collection of our local historical ornaments for sale. They make great gifts as well as home town remembrances. Order yours now! Histories inside bottom of each box. The Minersville Area Historical Society is a non-profit 501(c)(3) organization established to historically serve the community of Minersville, PA. For meeting times or to arrange for any donations, e-mail Dora at minershistory@gmail.com or ph: 570-544-9482 or Linda at 189linda@comcast.net or 570-544-5868. All charitable donations are tax deductible. 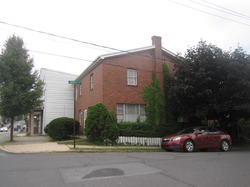 Our location: 100-102 S. Third Street; the Asenavage home has been received as a donation in 2016. WE NEED HELP WITH ALL COMMITTEES; PLEASE VOLUNTEER TODAY! Want to keep your history alive? Special thanks to Frank Reed Jr. for sponsoring our web site.